A beautiful Cow surrounded by roses and a small scroll design. The design is based on six different antique papers from my ephemera collection. The decoupage wooden platter measures 12 by 16 inches and is perfect for a wall, shelf or placed it in an easel. 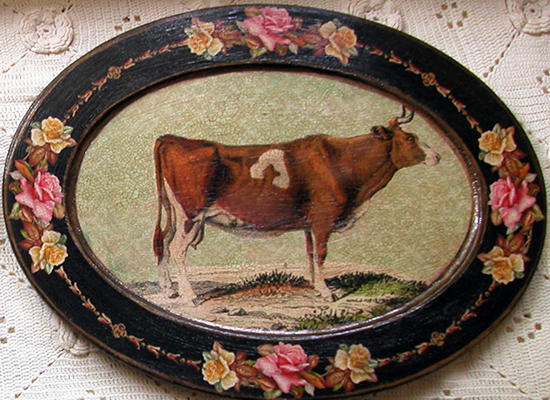 The roses are on a black background and behind the cow is a pattern on light green. The tray is accented with gold and the entire piece features my signature crackle finish. The tray is made to order and signed by the artist.